The Best Dehumidifier Blog is where we keep you up to date with the latest news from Best Dehuimidifier Choice. As new pages are posted, or established ones up-dated, we'll inform you first. If you've asked us to review a make or model of dehumidifier we'll let you know as soon as our review is "live". No need to visit us to find out, we'll visit you. We'll also be posting articles to answer the 1001 questions folks ask about dehumidifiers. Ask a question and get an RSS "phone call" when your answer appears. So, if you'd like to join in just click on that orange button. If you're new to RSS you'll find all the help you need when you click. That's the end of the "commercial", lets take a look at the posts on the Best Dehumidifier Blog today. The Frigidaire Dehumidifier is one of the Best Dehumidifier Brands. Read my reviews of the Frigidaire range here. Continue reading "Frigidaire Dehumidifier Reviews and Ratings"
The Frigidaire FAD504DWD 50 pint dehumidifier is a medium capacity unit designed to control humidity in small to medium sized basements not exceeding 800 square feet. Read our independent review at Best Dehunmidifier Choice.com. Continue reading "Frigidaire FAD504DWD 50 Pint Dehumidifier Review"
The Frigidaire FAD954DWD 95 pint dehumidifier is the largest capacity model currently available from Frigidaire. See our review of this unit at Best Dehumidifier Choice.com. Continue reading "Frigidaire FAD954DWD 95 pint dehumidifier review"
The Frigidaire FFAP7033T1 70 pint dehumidifier with pump conveniently pumps the condensate to a drain, even if it's a floor above your basement. Continue reading "Frigidaire FFAP7033T1 70 pint dehumidifier with pump review"
The Frigidaire FFAD5033R1 50 pint dehumidifier is a medium capacity model suitable for smaller basements and other areas of your home. See our review and recommendations at Best Dehunmidifier Choice.com. Continue reading "Frigidaire FFAD5033R1 50 Pint Dehumidifier Review"
The Mitsubishi MJ-E16VX Dehumidifier is one of the best models for a garage or a boat. Read our full review here. Continue reading "Mitsubishi MJ-E16VX Dehumidifier Review"
The Mitsubishi MJ-E16V Dehumidifier is an outstanding model for use in the home. Find out why at Best Dehumidifier Choice. 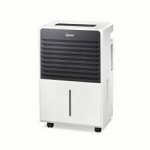 Continue reading "Mitsubishi MJ-E16V Dehumidifier Review"
Continue reading "Winix 50 pint dehumidifier 50BT"
Site visitors' questions about dehumidifier sizing and our answers. Ask your own question here. Continue reading "Dehumidifier sizing questions from visitors to our site"
Site visitors' questions about dehumidifier brands and models and our answers. Ask your own question here. Continue reading "Dehumidifier brands and models questions"
Continue reading "Visitor Reviews of Portable Dehumidifiers"
Continue reading "Low Temperature Dehumidifier Reviews by Visitors"
Site visitors' questions about dehumidifier iechnical issues and our answers. Ask your own question here. Continue reading "Dehumidifier technical questions"
Site visitors' questions about dehumidifier drainage and water buckets. Ask your own question here. Continue reading "Dehumidifier drainage questions"
Continue reading "Comments from our Visitors"
Site visitors' questions about dehumidifier trouble shooting and our answers. Ask your own question here. Continue reading "Dehumidifier trouble shooting questions"
Site visitors' questions about dehumidifier installation and our answers. Ask your own question here. Continue reading "Dehumidifier installation questions"
Site visitors' questions about dehumidifier features and our answers. Ask your own question here. Continue reading "Dehumidifier features questions"
Site visitors' questions about dehumidifiers and continuously running fans. Ask your own question here. Continue reading "Dehumidifiers and continuously running fans questions"
Continue reading "Basement Dehumidifiers - Santa Fe, SaniDry or Dri-Basement"